"Liquid breathing" from The Abyss. 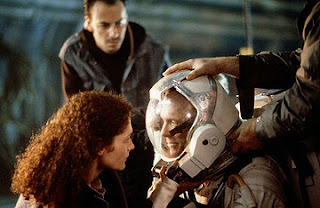 Remember in James Cameron's movie The Abyss, where Ed Harris' character was put into that funky diving suit which got filled with "breathing fluid" and he had to respirate through the liquid in order to survive a deep, deep dive? How about one better than that? Say... put a needle in your arm and shoot yourself up with breathable oxygen? Research scientist at Boston Children's Hospital have come up with a neat trick and it could revolutionize much of modern medicine: a nanoparticle which can be injected into a person and provide enough oxygen to maintain short-term "breathing". Okay, I don't see how this could maintained for very long, before the carbon dioxide has to be expelled out of a person's system and that's one of the bigger functions of the lungs. In fact, the 30 minutes limit cited in the article is very hard to believe, truth be known. Even a few minutes without CO2 being exhaled would be fatal. There would definitely be significant and possibly permanent damage. But for things like localized injuries, this certainly could be extremely useful. I'm also wondering how it could be used in therapies to fight oxygen-unfriendly situations like infection and most kinds of cancer.